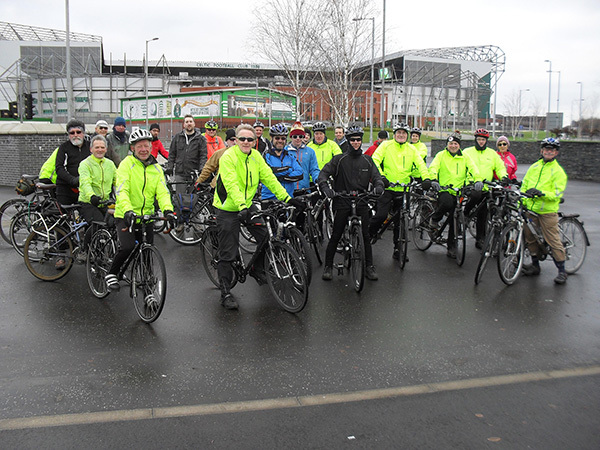 Go Bikers on Glasgow Cycling Infrastructure …..
26, ie 25 on the photo plus the photographer (taking a group photo outside his favourite football club), members and supporters of Go Bike took to the streets of Glasgow on Sunday 04 January to journey along the cycling infrastructure installed over recent years. We took in, among others, Connect 2, the Colleges Route, Langlands Road, the Clyde Tunnel, London Road and the Clyde Gateway, wondering why routes appear and disappear and cross from one side of a road to another with no apparent warning. Gives us plenty to campaign for this year and for years to come! Full details of the route can be found on this map, and some examples of the infrastructure we saw can be seen in these photos. The route was chosen since it includes several sections of recently built cycle routes, including routes to Commonwealth Games venues such as the Sir Chris Hoy Velodrome and Hampden Park which form part of the Glasgow 2014 Legacy. Happy New Year, Go Bike members and supporters. Let’s make 2015 the year we really start making our views clear to our elected representatives, ie our councillors, MSPs and MPs. Please join in and write to your local representatives about cycling issues so that we can push the active travel agenda forward. To support what Go Bike is doing, not just financially, but so we can demonstrate that we represent many cyclists in Glasgow and the Strathclyde area please, if you aren’t a member already, do join Go Bike – it’s by donation, so you choose the amount, here on our homepage. 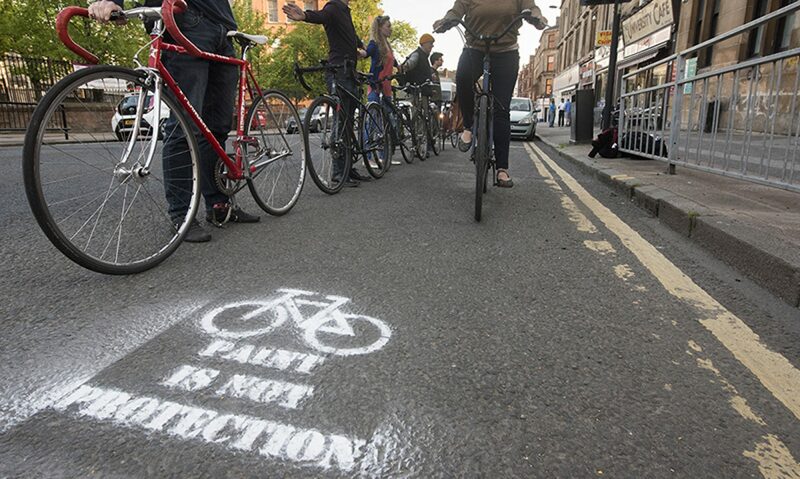 Go Bike has sustained the greater part of its objection to the proposals for changes in parking and cycling in the Dowanhill and Byres Road area of Glasgow. Our initial objection, dated 18 September, gained a response from the City Council on 17 December. Our reply was sent in on 31 December. See our Consultations page for details. Last Saturday, Keith Bruce writing in the Herald Arts supplement about the success of the Hydro and other venues at the SECC in Glasgow, bemoaned the fact that the city has done nothing “about the pedestrian assault course it currently is to get from the Argyle Street hostelries to the arena”. This reminded me of the works now under way by Glasgow City Council, to which Go Bike has objected, to “provide cycle routes in the area”, including the redetermination of the footway on the east side of Finnieston Street, shown above, to be 2-way for both cyclists and pedestrians. My letter on the topic is in today’s Herald. If you are a Herald reader, or just concerned about facilities for cyclists and pedestrians, please be ready to write in when the motorist response, as it surely will, gets published! 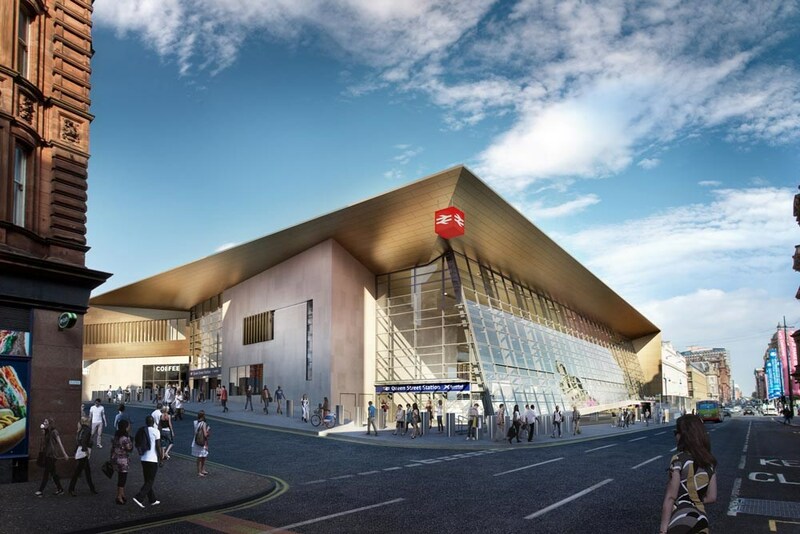 Yes, an artist’s impression of what Queen Street Station in Glasgow might look like. 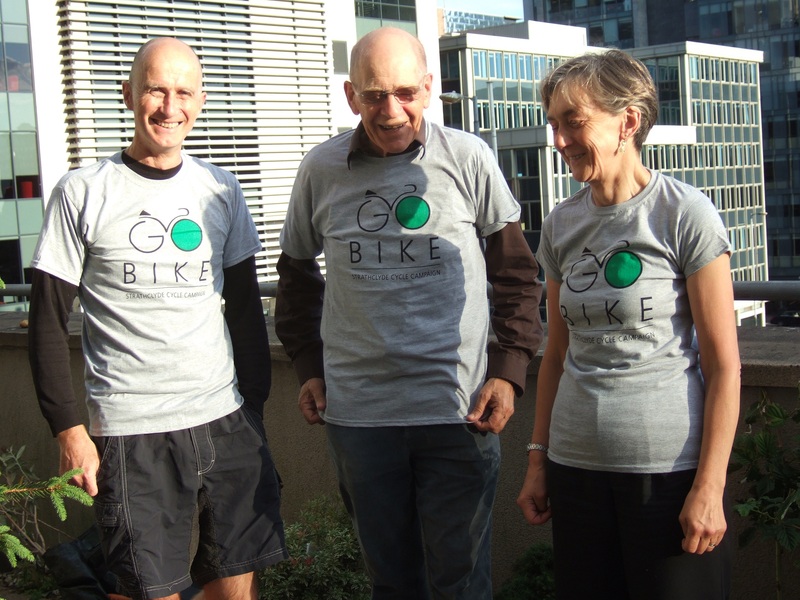 Go Bike have now submitted a response to the Stage 2 Consultation and you can see it here. Consultation closes next Tuesday, 23 December, so please write to Network Rail and tell them how much you wish to see good cycle facilities incorporated in the upgrade to the station. Wondering what to buy as a Christmas present, for yourself or a friend? Why not a Go Bike t-shirt? They are selling out but we still have some left, though not in extra large; they are all gone. Glasgow City Council’s reply to our objection to their proposals: motor traffic reigns supreme! I refer to your letter dated 17th November 2014 regarding the Anderston to Finnieston cycle route enhancements which are currently being implemented and are scheduled to be completed in March/April 2015. Section 1: Work has commenced on the first section of the path between Little Street and Port Street, which is now resurfaced and only minor snagging works still to be undertaken. The second section, which will extend to Finnieston Street and include some localised widening works will commence in the New Year. Section 2: The existing pedestrian crossings across the Expressway on and off ramps will be upgraded to Toucan crossings, improving the facilities for Cyclists travelling north / south. 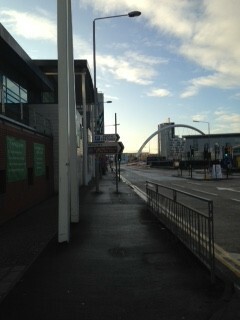 In addition a new Toucan crossing is being provided across Finnieston Street allowing access to the Exhibition Centre via a remote path and the enclosed access bridge. This new crossing will utilise an enlarged island whilst maintaining a staggered crossing to ensure it conforms to current design standards. Section 3: It is appreciated that the gyratory is not ideal for cyclists. However, any major changes to the wider carriageway layout which might facilitate a more wholesale enhancement are not financially deliverable at this time. Observation suggests that southbound cyclists use the carriageway – this is unlikely to change. The re-determination of the east footway will allow northbound cyclists following the existing bus lane to bypass the gyratory, legitimising present practice in an informal manor. A contra-flow lane was considered but could not be accommodated without significant impact on traffic accessing the SECC complex. The alternative option to follow the east footway will accommodate the less experienced cyclist. Obstructions created by street furniture are noted but are, by and large, not able to be improved at reasonable cost. Section 4: Widening of the path at the Garden Inn was considered but unfortunately the detrimental impact on general traffic movements into the SECC ruled out this option. Whilst wider proposals for this section are still in development and landownership is being investigated to establish what is available to ensure cyclists have a safe and desirable route, the advertising sign will be relocated to a wider section of path where it will not cause significant disruption. I trust the above is of assistance, however, should you have any further queries, please contact Ciaran Buchanan on 0141 287 9443. Andrew stuck to his guns, even in the face of strident criticism from a radio chat show host, who features on several slides, holding his hands up in horror. This compares favourably with Councillor Alistair Watson of Glasgow City Council, Executive Member for Sustainability and Transport, who said recently that he still feels the pain from introducing bus lanes in the city 11 years ago! HGVs diverted away from the city centre; a tunnel was constructed from the port to facilitate this. No requirement for helmets; take-up in Dublin far exceeded that in Melbourne, Australia, a similar sized city, where helmets are compulsory. Price; charges are relatively low. Target market: Dubliners not tourists. Hire stations relatively close together. Glasgow and other Scottish cities could learn from this; it was a shame our leading councillors were not there. Looking forward to next weekend – and the Go Bike monthly ride? Next Sunday’s ride is out via Barrhead via Pollok Park and exploring bits of Paisley. Not too far, and let’s hope the weather is like today has been. See here for further details.